Mahaffey is the leading provider of temporary base camps for multiple use applications. As an approved GSA provider, Mahaffey provides temporary structures for such projects as temporary troop cities, emergency response and semi-permanent warehouses, temporary military hangars and other applications. The U.S. Military has utilized Mahaffey Fabric Structures for turnkey base camps complete with sleeping structures, mobile shower trailers, power distribution, climate control and more building components. Mahaffey has the capacity to construct approximately 10,000 sq. feet of tent structures per crew per day. The U.S. military has utilized Mahaffey Fabric Structures for temporary barracks on numerous occasions because of our service, speed and efficiency. 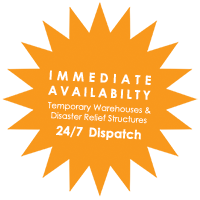 FEMA, DHS, American Red Cross and many more organizations depend on Mahaffey for temporary base camps. Our central location in Memphis, Tennessee enables us to reach most of the country via truck in less than 24 hours. Mahaffey's operations-focused team has the experience to meet your particular needs and the ability to produce additional portable structures as needed. Many relief missions require covered shelters for vehicle entrance and storage facilities. Mahaffey’s temporary warehouses, equipped with extra high sides and 16′ wide doors, allow even the largest military vehicles to enter and exit with ease. Mahaffey provides rapid deployment of logistical support services, often mobilizing within hours of a contract being issued. The Super Series structures were used as MWR, DFAC, and TOC facilities, all of which had electrical requirements powered by Mahaffey generators. Mahaffey specializes in the rapid deployment of temporary housing for military, industrial and disaster relief efforts. Our certifications are set in place to help to better our employees, improve their expertise, and to ensure the continuing growth of the products and services we provide. "Mitch Holt and the rest of the crew at Mahaffey's leadership, confidence, and extensive knowledge of all facets of supporting the training of our Nation's military forces has been evident in every training exercise they supported with hard work, sweat, and 'service with a smile' for Fort Polk, LA."